Have a glimpse of our research and development capabilities and scope. DTRamid® plastic, Vibramount® Active Engine Mounts, Switchable mounts, Durabush®, plastic subframe bushes are all examples from DTR’s long history of innovation and being first to market with new technologies. DTR is actively engaged in the challenges created by future electric powertrain technologies and supporting our customers to optimise their vehicles. even railway vibration management products & systems. Full system development and validation are the key to understanding the problems and solutions needed for modern powertrain, chassis and suspension systems. 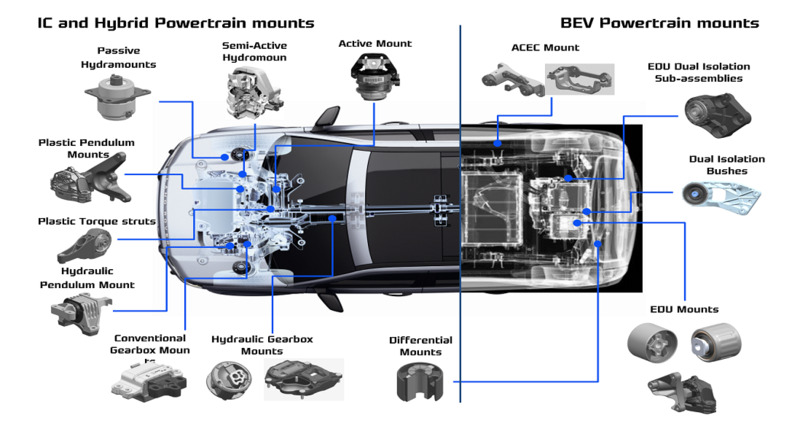 DTR works closely with many OEMs at the system level, helping to define effective solutions for the future. DTR is fully equipped with a range of CAE techniques to enable us to virtually validate new designs, from a single component through to full system analysis. By continuing to heavily invest in this area and through continuously advancing simulation techniques and capabilities, we are able to progress our “right first time” design philosophy leading to reduced development times and satisfied customers. DTR has a full range of specialised facilities and trained engineers to measure , test and validate our products and processes. These facilities and capabilities are invaluable when it comes to verifying new technologies and benchmarking products from the field. Each Tech Centre has its own test laboratory, but by standardising on equipment and techniques we are able to support each other ensuring effective utilization of our R&D resources. By continually reviewing the correlation between CAE and actual measured performance of both products and materials, we are able to ensure the continuous improvement of our CAE techniques.